It’s the morning after a snow blizzard and your driveway has been pummeled with snow. The snow is fresh and hasn’t iced over yet, so it’s the perfect time to shovel it off of your driveway so you can get to work right? Not so fast. Before you take to the snow, you should take some precautions. There are some hidden dangers involved with snow shoveling that you should be aware of. There is a deadly effect of cold weather on the heart. Sudden exertion such as snow shoveling among other activities in cold weather can trigger a heart attack or sudden cardiac death! Strenuous activities can cause an increase in blood pressure and heart rate. 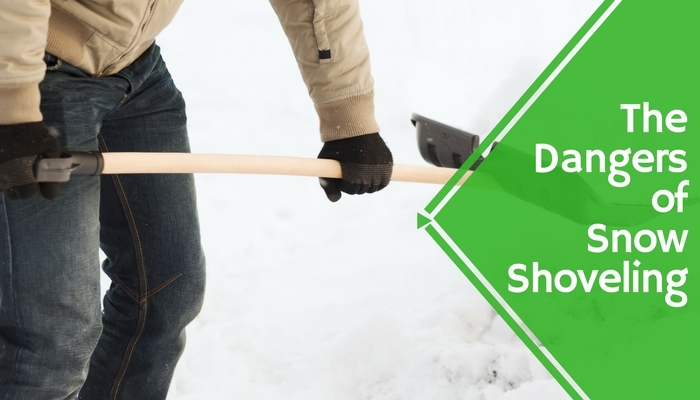 Snow shoveling is particularly threatening because the activity utilizes heavy arm work which causes you to exert more energy than you would if you were doing the legwork. That combined with cold weather can cause a constriction of the blood vessel and decrease oxygen to the heart. When your heart doesn’t get oxygen, you will end up in a cardiac arrest. People who are most at risk for this are those with a medical history of heart attack, those with a heart disease, smokers, those with high blood pressure or high cholesterol, and those who lead a sedentary lifestyle. This may seem counterproductive, but try not to shovel in the morning. Blood is more prone to clotting in the early morning hours or immediately after you wake up. We recommend waiting at least an hour after you wake up before doing any strenuous activity outside. Also, don’t eat heavy meals before shoveling snow. Blood can get diverted from your heart to your stomach. Avoid things like smoking or drinking coffee during shoveling breaks or an hour before and after shoveling snow. These things elevate your blood pressure and heart rate and can contribute to a loss of oxygen to your heart. Remember to warm up our muscles by walking a few minutes or marching in place. Be sure to talk with your doctor about shoveling snow and how you can take even more precautions based on your personal medical history. While shoveling snow try to push rather than lift. Use a small shovel so that you are moving smaller loads at a time rather than big ones. Take frequent breaks and drink plenty of water. Cover your head and neck to keep in your body heat and dress in layers. Pay careful attention to your body at all times watching for warning signs of heart attack such as not being able to catch your breath, dizziness, feeling light-headed, or experiencing tightness or burning in your chest, neck, arms, or back. We advise anyone over 55 or anyone who is not used to strenuous activities to avoid snow shoveling. Although it may seem harmless, it is anything but. People don’t realize how dangerous it can be. BBC News in Canada reported over 1000 deaths associated with snow shoveling in the span of just over a decade. While snow shoveling is a necessary task, it can be a dangerous one. Be very careful when doing any strenuous activities outside while temperatures are low or below freezing. Things can escalate quite quickly and create a problem before you know it. Take the proper precautions to keep yourself safe this winter. No Replies to "The Dangers Of Snow Shoveling"